According to Visit Britain, last year 59 million people decided to ditch the never-ending airport queues and currency exchange headaches by opting to enjoy the Great British countryside on a summer staycation. With stunning breaks to some of the UK’s most picturesque destinations, leading walking and activity holiday provider, HF Holidays, has a wide-range of guided walking holidays for anyone looking to make the most of the great outdoors this summer. Highlights are below, with more information available at www.hfholidays.co.uk. Summer is the perfect time to visit Church Stretton, as 300,000 flowers are planted there every year, making this Shropshire town a great place to experience Britain in bloom. Travel a little further to discover rolling green hills, sleepy villages and charming market towns with their iconic black and white timbered houses. Stay at Longmynd House, a charming base set in a wonderful elevated location above the town of Church Stretton complete with extensive public rooms and countryside walks right from its doorstep. Price: 3 nights departing 17th August 2018 from £309pp. Price includes full board accommodation and a selection of daily guided walks. To book, visit www.hfholidays.co.uk or call 0345 470 7558. The beauty of the Derbyshire Dales is best discovered on foot, with stunning limestone valleys, gritstone edges and timeless villages to explore, there is a never ending list of countryside to explore. After a long day exploring the Dales, relax and enjoy a drink with friends, with a selection of hand-picked local ales available. Stay at Peveril of the Peak, a classic country house surrounded by extensive grounds to enjoy. Price: 3 nights departing 3rd August 2018 from £344pp. Price includes full board accommodation and a selection of daily guided walks. To book, visit www.hfholidays.co.uk or call 0345 470 7558. 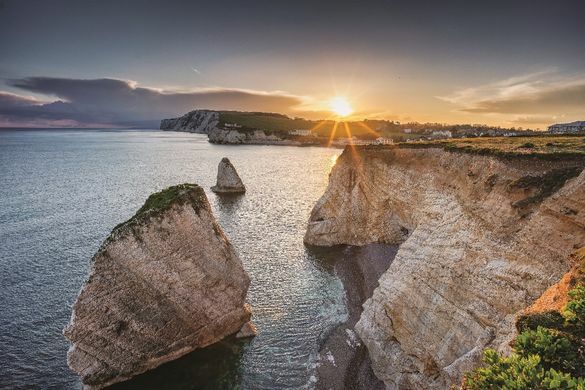 The dramatic coastline, heather-covered cliff tops and sandy beaches of the Isle of Wight make it a walkers’ paradise. With a chance to soak up the sea air, spot wildlife in Ventnor’s Botanical Gardens and even discover castles and windmills along the way, there is so much to see on this traditional British seaside break. There is even a couple of delightful ice cream spots to stop off along the way. Price: 3 nights departing 18th July 2018 from £309pp. Price includes full board accommodation and a selection of daily guided walks. To book, visit www.hfholidays.co.uk or call 0345 470 7558. Take in the idyllic shores of Loch Leven and the dramatic rolling mountains of the Scottish Highlands. With challenging walks up Ben Nevis that will push you to your limits or peaceful strolls around the Glens and woodlands available, there is something to suit everyone on this outdoor escape. After a long day’s walking you can enjoy wholesome, locally-sourced meals and maybe a dram of Scottish whisky too, in the comfy surroundings of Alltshellach, a four star country house. Price: 3 nights departing 1st August 2018 from £319pp. Price includes full board accommodation and a selection of daily guided walks. To book, visit www.hfholidays.co.uk or call 0345 470 7558. With rolling hills, magic waterfalls and picturesque rural countryside in every direction, Malhamdale is the perfect destination to get away from everything and be at one with nature. Explore quiet country paths or put your legs to the test with more testing hikes across the Dales, with a vast selection of routes available. Enjoy hearty local food and accommodation at Newfield Hall, a 19th century country house which offers relaxation and comfort. Price: 3 nights departing 3rd August 2018 from £329pp. Price includes full board accommodation and a selection of daily guided walks. To book, visit www.hfholidays.co.uk or call 0345 470 7558. Places are limited on these holidays so book now to avoid disappointment. For more information on HF Holidays, please visit www.hfholidays.co.uk or call 0345 470 7558. For media information, please contact Louise Iles, PR Account Director, Mira Cowap, PR Account Manager, Michael Leonhardt, Senior PR Account Executive or Daniela Ferrante, PR Assistant at Gough Bailey Wright on 01527 579 555, lou@gough.co.uk / mira@gough.co.uk / michael@gough.co.uk / daniela@gough.co.uk. HF Holidays has 18 country houses in the UK’s National Parks and Areas of Outstanding Natural Beauty as well as independent hotels for overseas holidays. HF Holidays has a host of accolades under its belt including: Which? Number one Recommended Holiday Provider 2017, Silver Travel Awards Best Activity Tour Operator 2017, Feefo Gold Service Award in 2017, Which? Recommended Provider status for 2012 – 2017; voted Best Large Tour Operator by Guardian and Observer readers 2010-2014; and Best Large Short Break Operator 2011-2014.